Today’s ultra-slim, slick iPhones look beautiful, but they’re not always easy to keep a hold of. That’s why Speck designed cases with a raised rubber ridges that provide a comfortable and secure no-slip grip. 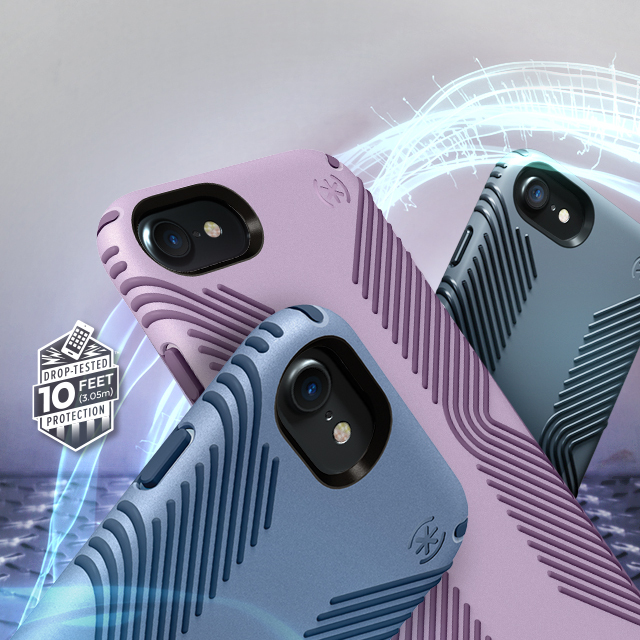 With the new Presidio™ GRIP cases for the iPhone 7 and iPhone 7 Plus, we took our iconic CandyShell Grip pattern and redesigned it with a modern style. The new angled grip pattern offers a no-slip hold no matter how you hold your phone, and it’s perfect for texting, gaming, and taking photos. Presidio™ GRIP comes with the same benefits of many of our other Presidio cases, including the IMPACTIUM™ Shock Barrier, for superior drop-tested protection. Plus, it has a modern matte finish that resists scratches. The case comes in six new colors, including the sleek Black on Black and a bright Lipstick Pink on Shocking Pink. You can pick one up for the iPhone 7 or iPhone 7 Plus on Speck’s website right now.